Another new year is here. When a child is born into a family, it makes everyone happy, but at the same time, it also makes everyone alert. The parents will be careful that the child doesn’t fall down. They will make sure that its clothes and surroundings are clean and properly dusted. They will watch the child’s each and every movement. With each day of the child’s growth, the family is filled with joy and delight. They eagerly watch as the child attempts to stand up and walk.​They soon begin looking​expectantly forward for the child to speak. This is how we should welcome the new year—with joy and alertness, living its every moment completely. Looking back at the year gone by, there have been many traumatizing events. Extremely cruel terrorist attacks in different parts of the world that claimed numerous lives, the heart-breaking refugee crises, earthquakes, disastrous floods in Chennai were some of them. In Chennai, people went happily to bed at night, and by morning the water had risen and washed away everything they had. This is the nature of life. That doesn’t mean we should not put in any effort. We need to do everything possible to avert such natural tragedies. However, even in the midst of disasters like the Chennai floods, there was a silver lining–the men and women who forgot themselves and risked their own lives to wipe the tears and save the lives of others. They thought beyond barriers of caste, religion, and nationality. They showed us that compassionate people have not become extinct–that ​the ​language of selfless service continues to be spoken here. This inspires us with hope. Let us pray that the lamp of compassion continues to burn brightly in the at least some human hearts. Natural disasters like the floods in Chennai warn us about how alert we need to be when it comes to protecting Nature’s harmony. Today we are seriously worried about global warming and its effects. If global temperatures continue to increase, the result will be disastrous. The planet earth may continue to exist, but not a single member of the human race will survive. In December, the leaders of 195 countries signed an agreement at the United Nations Climate Change Conference [COP 21] in Paris. Let us hope and pray that their efforts to solve global climate change are successful and that their decisions come to fruition. If things continue to deteriorates they are, then by 2020 or 2022, the earth’s temperature will be soaring. We all know about the depletion of the ozone layer in the stratosphere and the ozone hole. This year, let us put in more effort to plant trees and to do organic farming. It would be great if each household were to make their own compost. Even those who live in flats can collect the food waste in a separate container and make compost from it. They can also grow vegetables and trees in either buckets or plastic drums or pots. Carpooling should be encouraged more. The numbers of vehicles on the road have increased, leading to more atmospheric pollution. If there are five people working in the same office, or in the same area, they can use one car instead of five. People can split the cost of the fuel. Thus, carpooling will help us to reduce our diesel expenses and reduce atmospheric pollution as well. It will also​ ​reduce the time it takes to reach our destination, as the number of vehicles on the road will decrease. Moreover, with the money saved, many poor people can be helped. As far as spiritual aspirants are concerned, New Year’s is an opportunity to introspect, do some self-evaluation, and see how​ ​much further we have moved along the spiritual path. We have a long way to go and very little time remaining. When compassion enters our actions, its waves begin to influence others as well. Such actions enable us to receive God’s grace. A mind that does not swell in arrogance at success, a mind that does not falter at failure, a mind that delights in giving, a mind that accepts criticism gracefully–we all should have such a mind. Those who have such a mind​ ​can never fail. And even if they do, those failures will not affect them within. The external situation may not always be favorable, but they will never internalize their disappointments or failures. They will be grateful towards everything in life. They will be true to their conscience. Even the longest journey starts with the first small step. Let each of us welcome the New Year by starting to make small changes in our life. If each of us can do this–who knows–it may mark the beginning of a new age altogether! 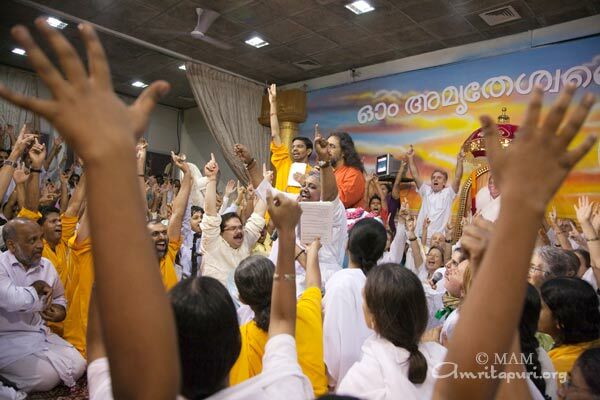 Let us surrender it to the Paramatman and move forward together with one mind towards a single goal. 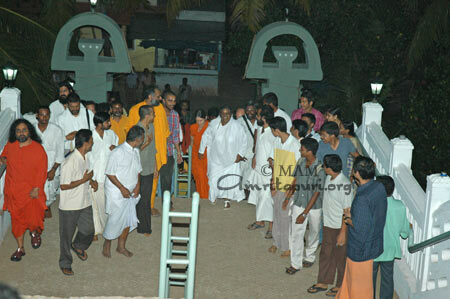 The dawn of 2011 was celebrated in grandeur with Amma here at Amritapuri. 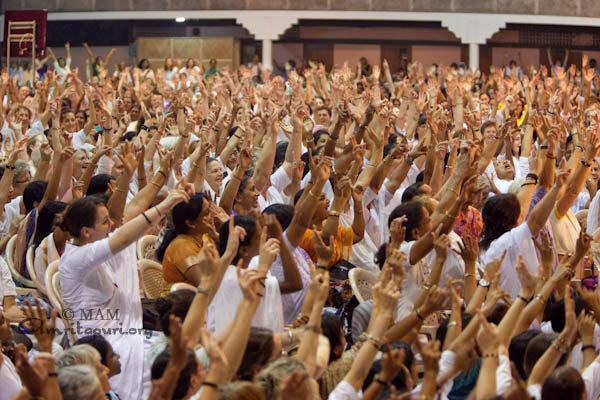 In addition to Indian devotees, more than 1500 visitors from abroad had flown in to be with Amma for the new year. The evening hall was packed and every corner had people from various regions and languages. 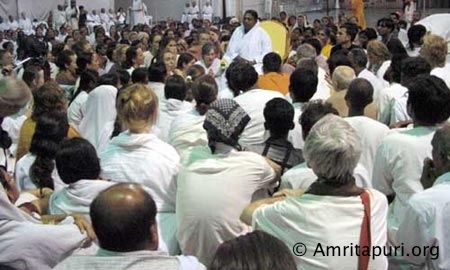 One family had even driven all the way across Europe and middle-east to reach Amritapuri by road. 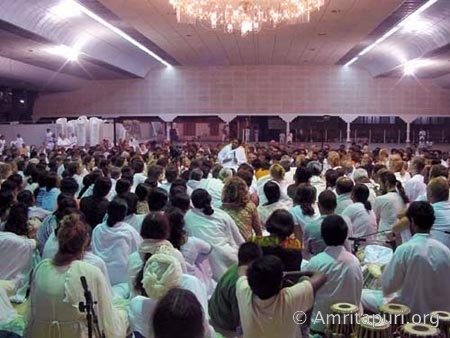 Immediately after evening bhajans, the hall was rearranged with Amma’s seat in the center. At 10, cultural programs commenced the celebrations. It was raining heavily outside. 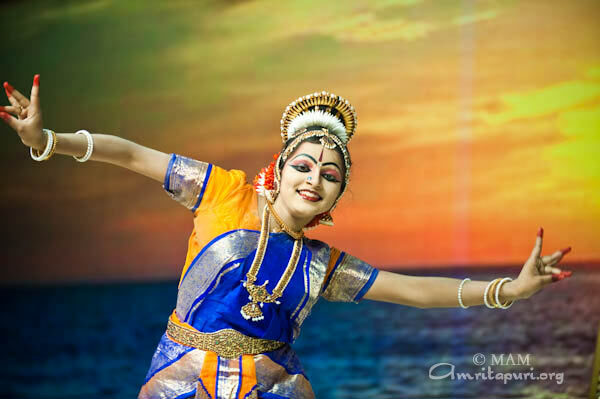 Ganesha Vandana, a Bharat Natyam dance was the first of the performances. 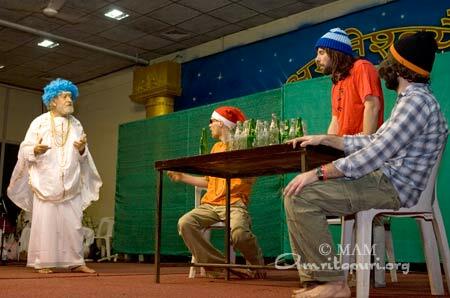 Student groups of Amrita University presented a skit on “Amala Bharatam”- Amma’s recent India clean-up initiative. 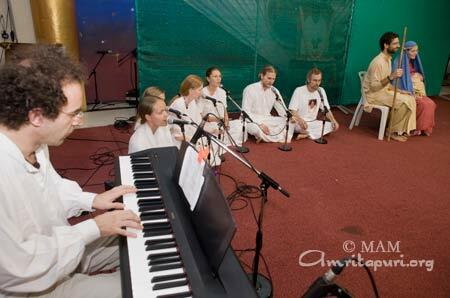 A rap song, themed “Lokah Samasthah Sukino Bhavantu” was performed by Ayudh UK. 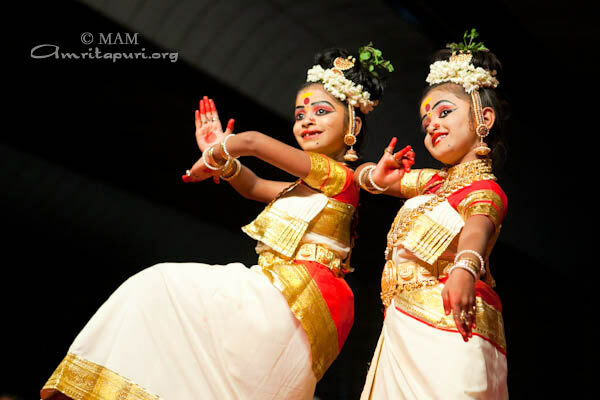 The next dance was by Gauri, a tiny tot who enthralled the audience with her exquisite Bharata Natyam dance. After the performance, Amma took her on her lap and asked a few questions; the shy Gauri flashed a smile that lighted up everyone watching the scene. The last two performances included a symphony of English songs followed by a dance themed on Hanuman Chalisa. It was 11:52pm and Amma started her satsang, “Rather than giving a message, Amma would like to pray for World peace and happiness”. Amma wished her children to always remain happy. 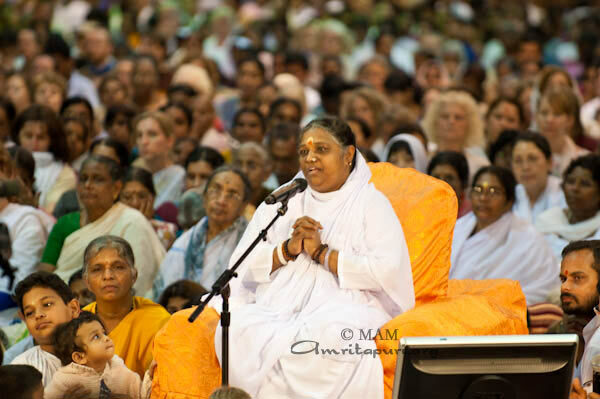 “May love, light, compassion, fragrance and beauty fill your heart in this new year”, Amma concluded. 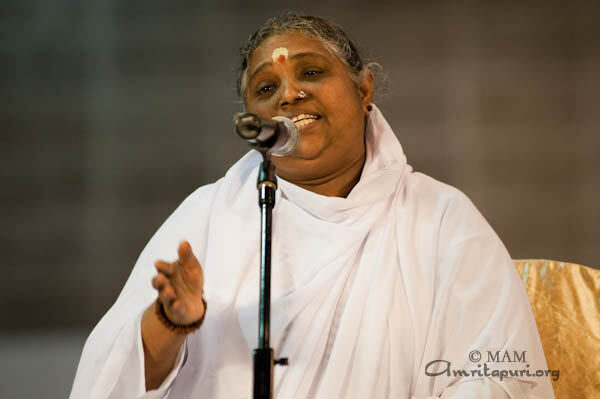 She sang the bhajan “Kushiyon ki bahar”, a song that talks of continued happiness in life, ending with the phrase “Om Lokah Samastha Sukhino Bhavantu – May all beings be happy”. 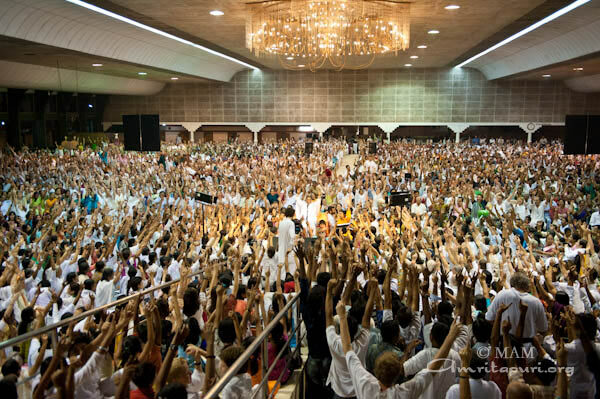 As Amma chanted “Lokah Samastha”, the whole hall repeated it. 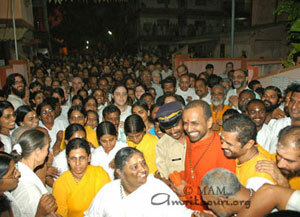 As the chants continued, tears swelled in Amma’s eyes. 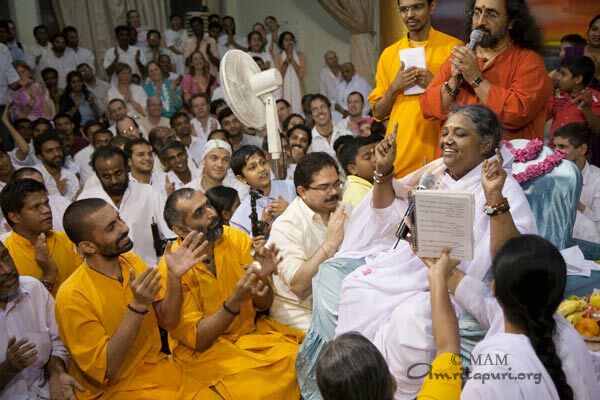 Amma then asked all her children to forget everything and sing with joy and with a mood of celebration. 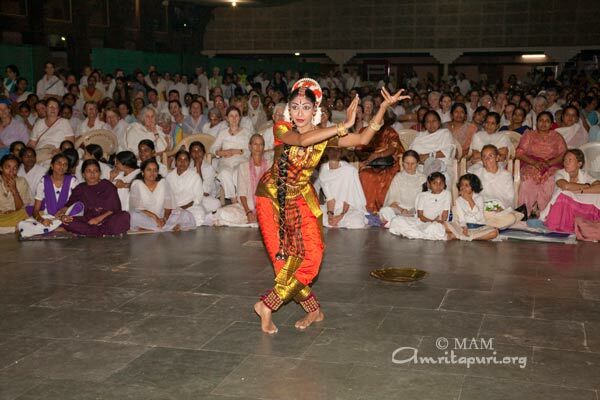 As it finished, she raised her hands and hailed “Mata Rani ki” and whole hall resounded with a loud “Jai”. 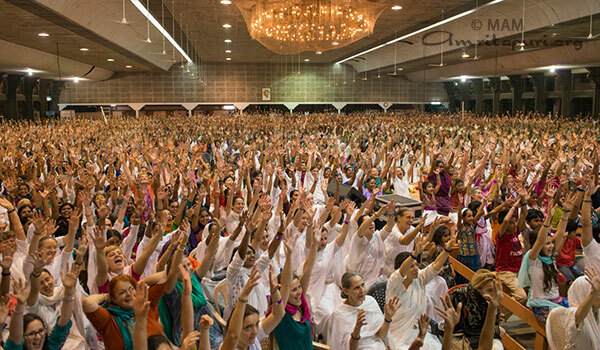 Amma’s raised hands were met with everyone raising theirs and the wave of open palms prayed for world peace and happiness. 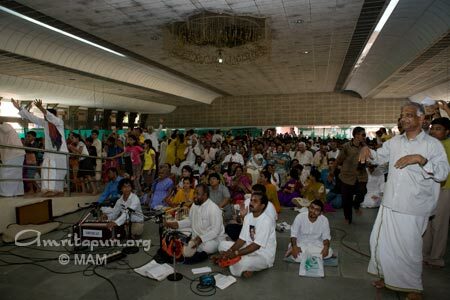 Thousands of people gathered in the Ashram Main hall on New Year’s Eve with Amma to welcome 2010. The celebrations began at 11pm with a series of cultural performances. 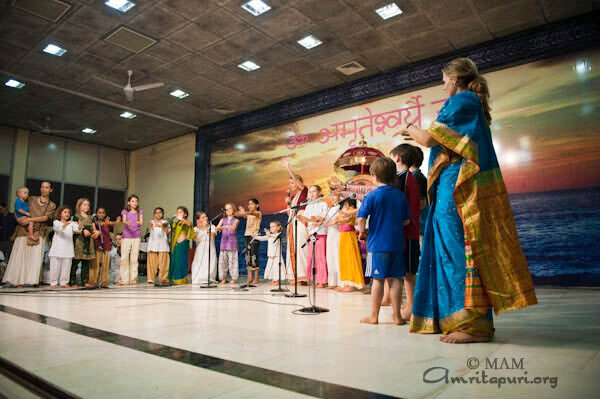 A group of children began with a song “I am the light of the world, I am wonderful, I am beautiful…” The second performance was a monologue in Sanskrit by an Amrita University student on the benefits of advances in technology vs. advances in human relationships and compassion. 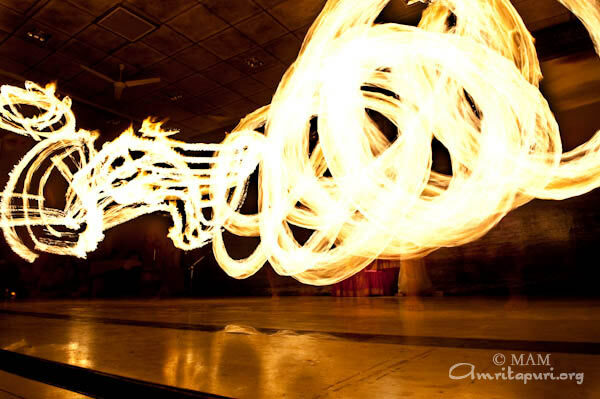 Next a spectacular fire dance and juggling performance entertained the gathering followed by a traditional Indian dance, a classical piano solo, and a short play put on by children. The cultural performances ended with a beautiful rendition of one of Bach’s violin concertos. 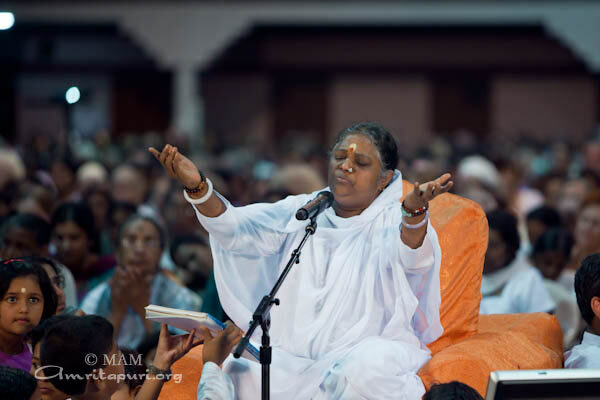 As the hour of midnight approached, Amma asked all to pray for world peace and then led everyone in chanting ‘Lokah Samastah Sukinau Bhavantu.’ After the changing Amma gave her New Year’s message during which she explained the true meaning of celebration. “Celebration is forgetting oneself. It is an attitude. We need to have good control over the mind for that. The thought that ‘I am limited individual’, ‘I am this body’ will not help up us to forget our self. The faith that the self in me and the the consciousness behind the universe is the one and the same is the basis of the celebration. ” Amma said. “Just by the clock striking at 12.00 on 31st December, our life is not going to be celebration. For that our mind should be filled with love and compassion. When love and compassion fills our heart you find newness in every moment, you never get bored, always enthusiastic, always happy and life always become a celebration. ” Amma elaborated. “We take various vows on New Year but how deep is it? We have to evaluate.” Amma asked everyone to introspect. “We have the ability to overcome our negativities. We sincerely have to try” she encouraged. “We are not isolated islands. We are like a ring in the chain, connected to each other. 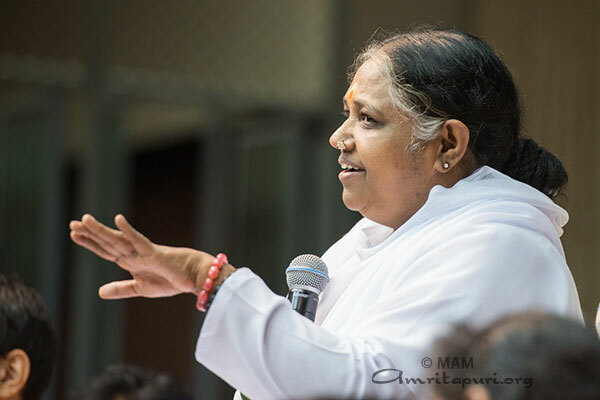 Don’t expect others to change first, if we change ourselves others will also change,” Amma reminded every one. Amma then led all in singing Khol Darwaza which ended with all chanting ‘Jai Mata Di’. 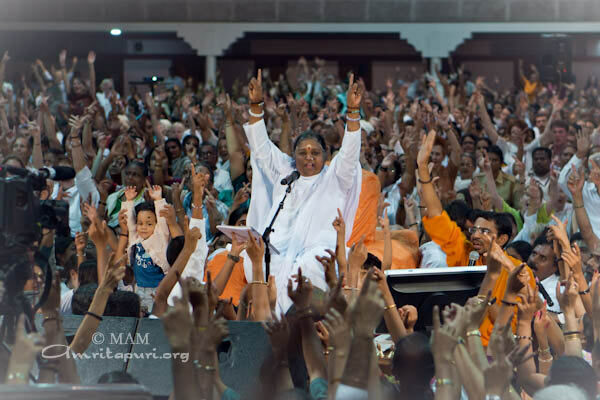 Louder and louder, as it grew, everyone echoed Amma’s chanting, throwing their hands up in the air. At the end, Amma said, “Amma’s heartfelt prayer is that everyone should be able to laugh and be joyful like small children and may divine grace bless us for that. 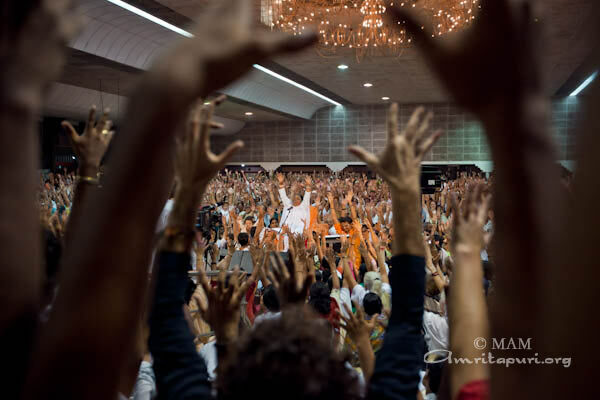 May the darkness be completely eliminated and may the pure light of God shine.” Amma asked everyone to raise their hands with their open-palms and shake them while responding to ‘Mata Rani Ki’ with a “Jai”. Then came Amma’s New Year’s address. 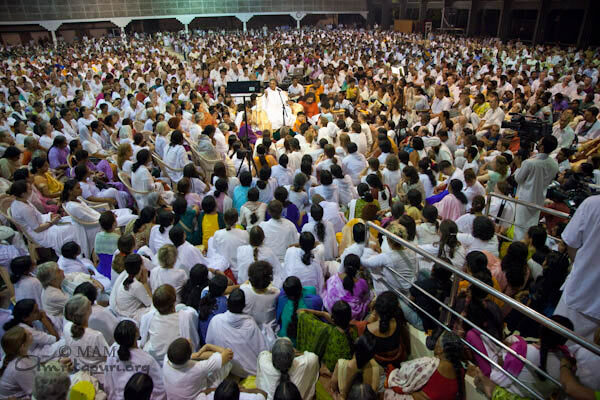 “The year 2009 is taking birth in the midst of many different challenges,” Amma began. 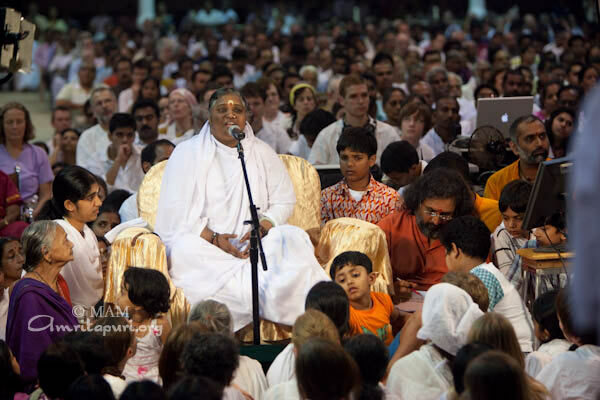 “On this occasion, there are so many nascent problems upon which we need to deeply contemplate.” Amma went on to mention the economic crisis, war, global warming, terrorism, increase of mental problems, the neglecting of the elderly and the deterioration of families. Amma told the devotees that she felt if people took the necessary steps, moving forward with awareness and discrimination, that the various problems the world is facing could be mitigated. But she lamented the fact that human beings are losing their ability to stand up and face challenges and to follow through acting with determination. 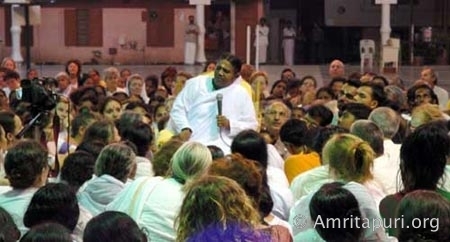 It is only through spirituality, Amma said, that we can develop the strength that will empower us to face all the challenges life brings our way. “In life, things rarely happen according to our expectations. This is why it is very important to develop the attitude of surrender to God. This will also help us to live in the present moment. If we learn to live in the present moment, we will be able to cheerfully accept any circumstance we may have to face in life. 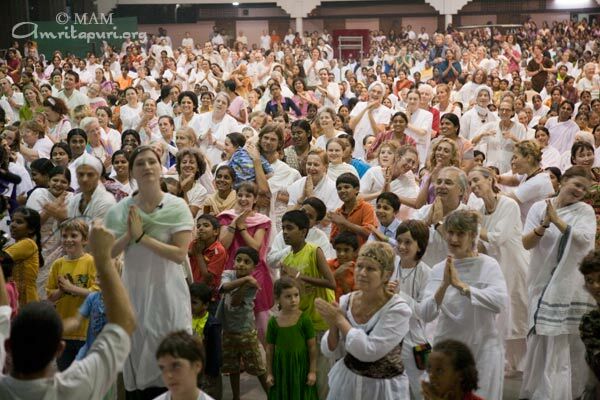 Amma then led everyone in two bhajans—“Mata Rani” and “Kushiyonki.” The latter was an ecstatic celebration of life, the former a compassionate prayer—attitudes to cultivate in 2009. The calendar year might have been about to change, but thankfully, Amma wasn’t. 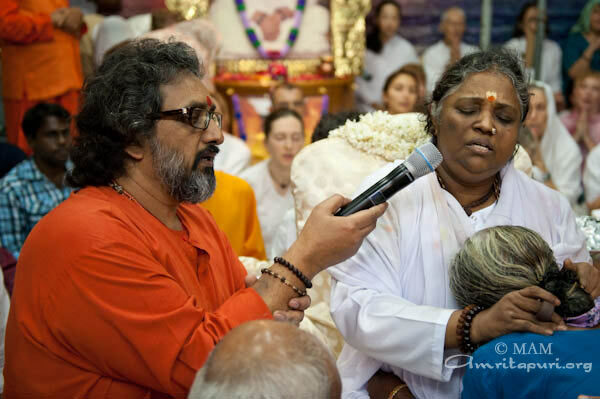 She was still doing what she has been doing Her entire life – giving darshan, pouring compassion and raining Love- as the new year approached. 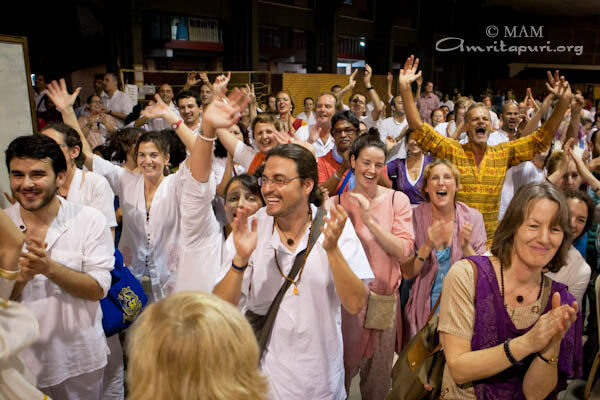 Everyday is a celebration with Amma, but there are some days that are more special than others. People had gathered from all corners of the globe in unprecedented numbers to celebrate the New Year with Amma and pray for world peace and happiness. Amma’s western and Indian children had put together a new year treat for everybody. This program auspiciously commenced with a classical dance presentation exuding the beauty of the traditional Indian art forms. 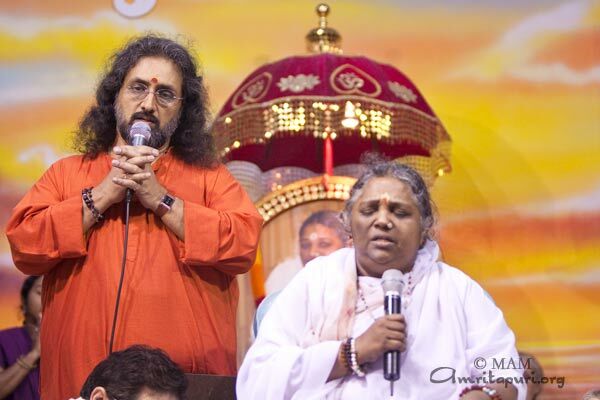 A speech followed, presented by young Amrita based on the message that the new year heralds, and how everyone, especially children, can imbibe the teachings of Amma and express them in their lives in this new year. 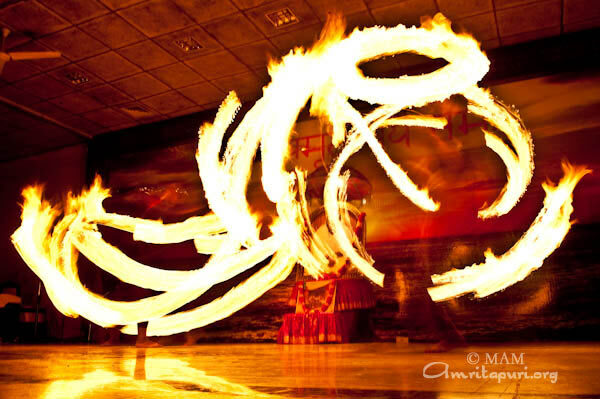 The ‘Fire Dance’ that ensued was stunning. 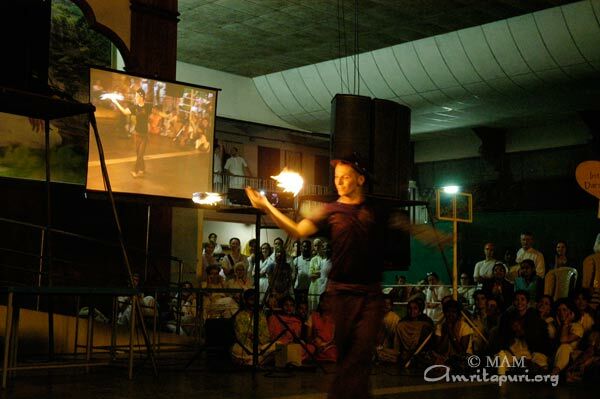 The juggling act with the burning sticks brought everyone to their feet. 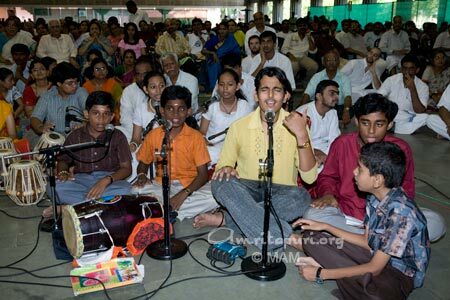 This was followed by a captivating group song rendered in different languages by Amma’s western children. The song was an heartfelt prayer for world peace and happiness, interspersed with beautiful flute solos. This was a song about how life would become a celebration once we learn to love everyone and live together as one family. 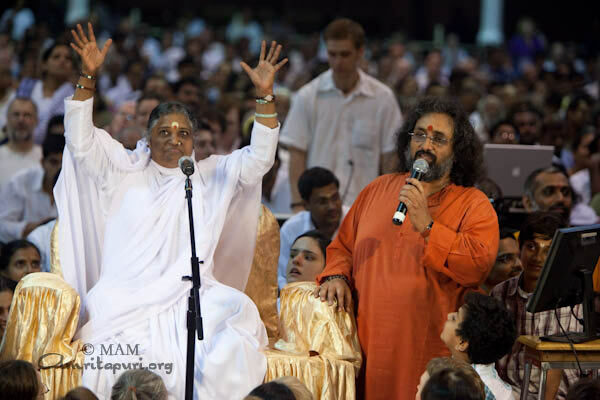 Though the message was emphasized through gestures – no emphasis was required for the message to get through once the tempo had picked up – it really did become a celebration as people could not help but get up and dance – in this celebration called life (with Amma). By now, everybody was warmed up for the subsequent extravaganza. It was time for hip-hop! It was time for us to showcase, hone (or just plain investigate) our hip-hop skills. It was led by a German girl, who gave a crash(!) course to all present on the steps involved. 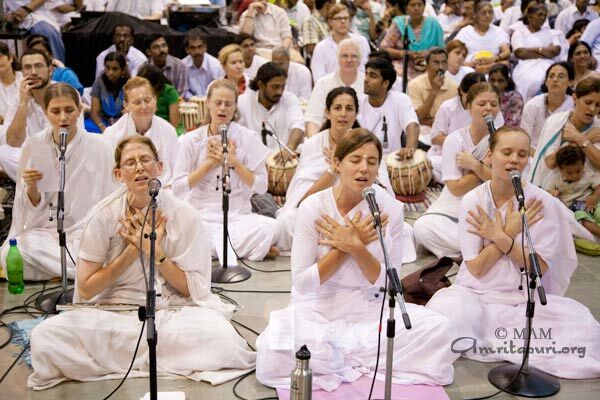 The song chosen was Amma’s bhajan ‘There should be one day…’, but remixed in hip-hop rhythm and matching beats. 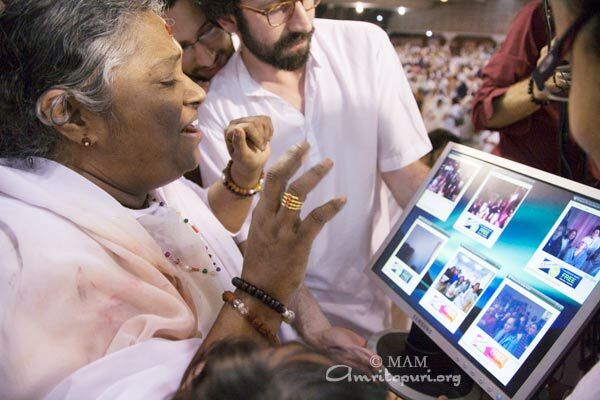 After a couple of practice rounds – it was time to show off to Amma the newly acquired expertise. And so it begun. It was a joy to see everyone participate with such childlike fervor. For many, it was more of hop than hip, but still everyone, including Amma immensely enjoyed it. 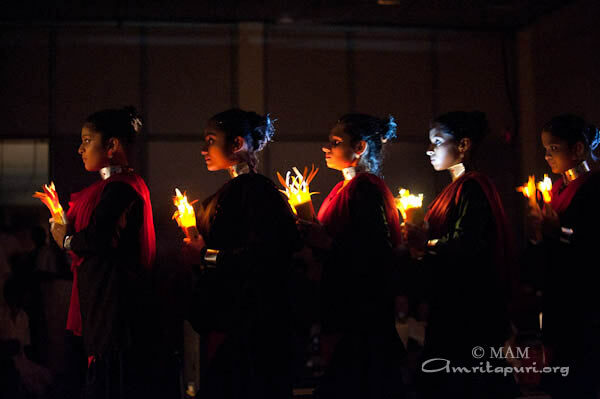 Nursing students of Amrita University arrived on the stage with months of practice behind them. 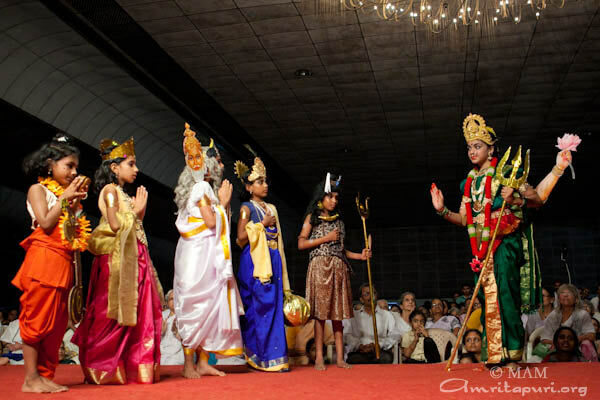 They were here to present a performance of ‘Jyotirlingam Mahatmayam‘ – depicting the glory of the 12 Jyotirlingams (sacred sites connected with Lord Shiva) across India. It was a stunning performance replete with outstanding grace as the legend associated with each of the Jyotirlingams was beautifully depicted in the group dance. The hard work and the practice that had gone behind the show was self evident. Another traditional dance – but this time it was the Spanish traditional dance – the Flamenco! The flamboyantly graceful steps on the the catchy beat captured all hearts. 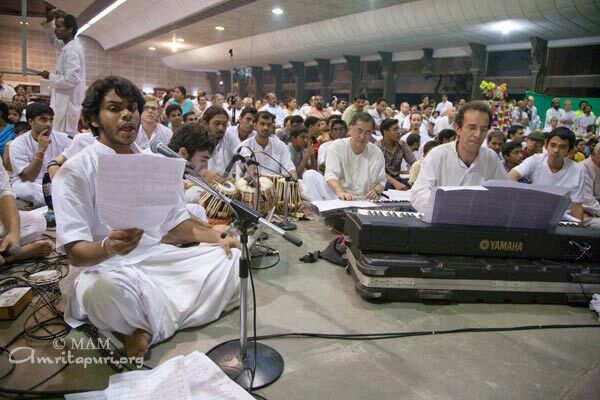 The mood changed to somberly devotional as Rohan, from USA, presented a version of “Stand by Me” and “You lift me up” in sonata. It was truly uplifting music for the soul – coming straight from the soul. 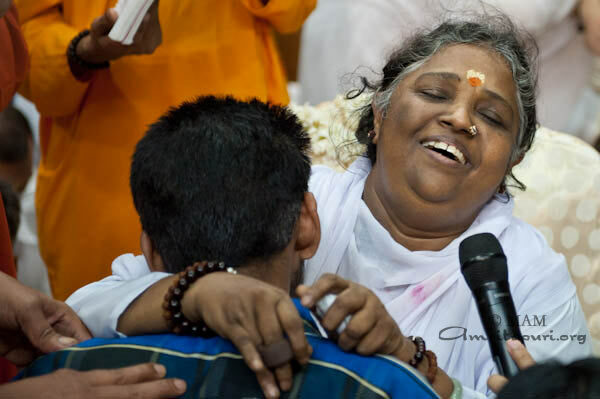 Though the timbre might not have been as exquisite, still all hearts joined in the song with the poignant longing as theycould see Amma tirelessly continuing with the darshan – still lovingly there for everybody and still lovingly with everybody. 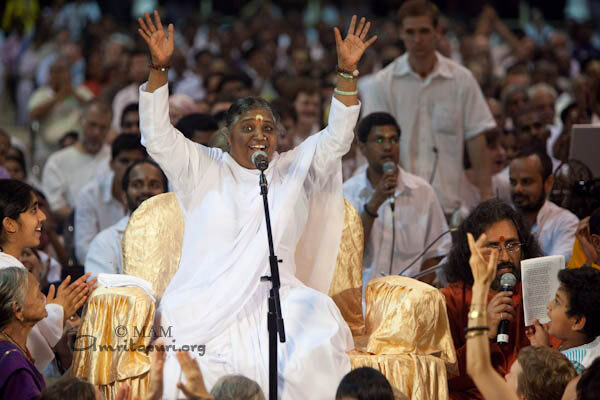 Soon the clock stuck twelve, and beginning the new year in the most auspicious manner – Amma led everyone in chanting ‘Lokah Samastah Sukhino Bhavantu’. 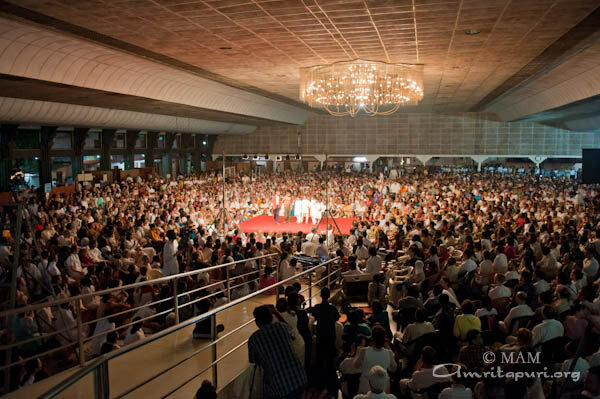 The hall resonated with this ancient mantra as Amma encouraged everybody to visualize the vibrations of peace spreading out into entire creation. 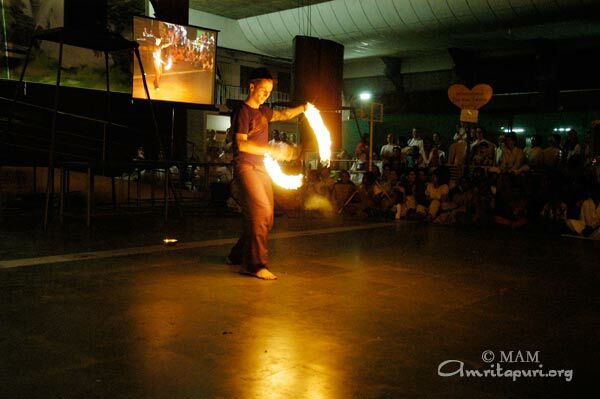 As the message was finishing, the students of Amrita University were already warming up for the grand finale. 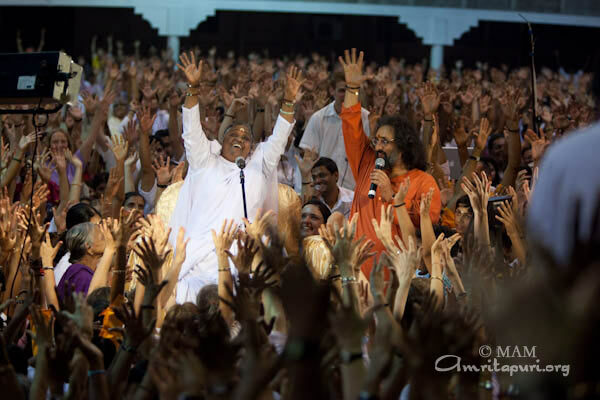 As Amma called for the harmonium, everybody knew the time had arrived – the time to dance the way into the new year. And truly enough, She began singing the evergreen “Mata Rani”. The souls and the bodies knew no bounds as everyone joined in the dance, and the hall was commotion of flailing arms and hopping legs. The tempo reached a crescendo, and still it would not stop. Not that anybody wanted it to. Finally it did stop. But not the joy in the hearts of Ammas children lingered. 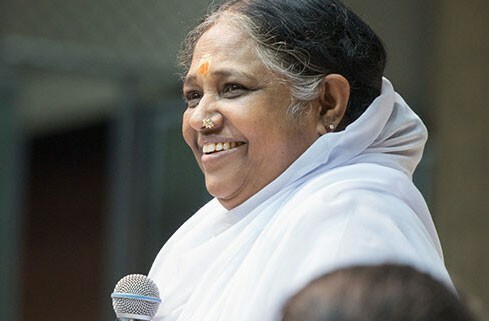 Having woken and opened everybody up, Amma began the bhajan “Lokah Samastah Sukhino Bhavantu” to elucidiate that one needs to share this Joy that one feels to all the suffering people around. 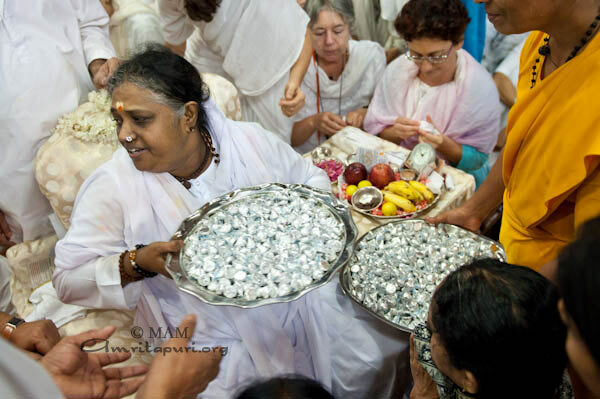 At the end of this soul stirring bhajan, Amma rounded off a perfect day for everyone by giving instructions to serve ‘payasam‘ (sweet pudding) to everybody. Nothing can be sweeter than Amma’s Love. 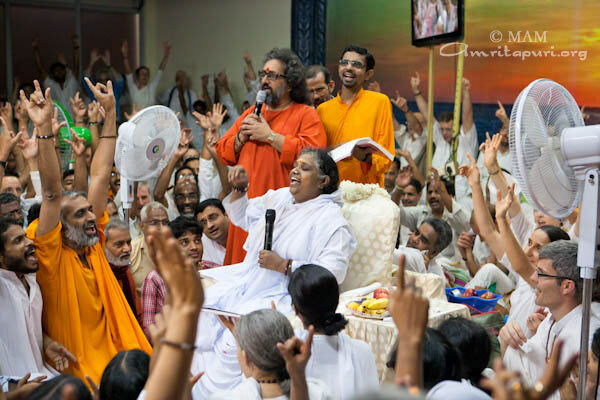 As each one delved into it, they savored the moment – one can only try to contemplate the good fortune that they have been blessed with by being in the presence of Amma- a mother who would go to any lengths to create every resource necessary for the growth of Her children. She uses every opportunity towards this end. Through these ‘celebrations’, She is trying to teach that Life is a celebration – only if one can allow it to be.One does not have to wait for these ‘special’ occasions for the joy that is inherent in each one us to manifest itself. 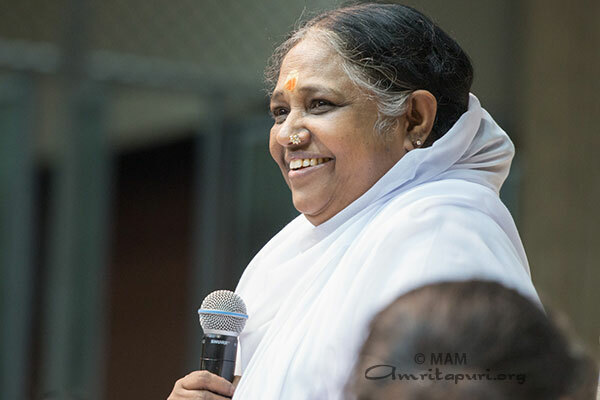 One just needs to be completely open to this moment because with Amma, each moment is special – each moment is a new beginning- beginning of the rest of each one’s life. May each one of us make the best use of this precious opportunity to truly live that peace and happiness that man has been searching for – not only on this new year eve but ever after. When the clock struck midnight, Amma had been giving darshan for more than 13 hours. 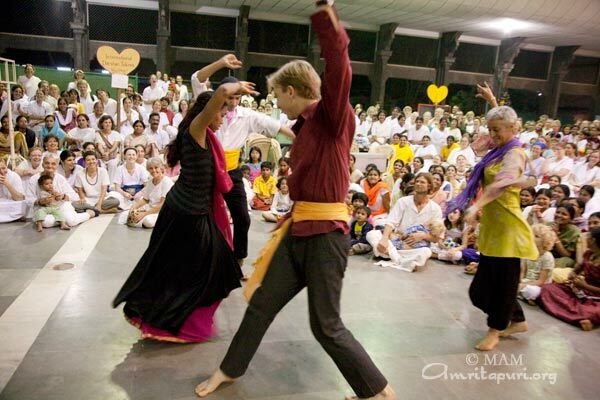 The New Year’s Eve dances and other cultural performances had taken place at Amma’s side. Darshan finished almost exactly with the beginning of 2006. 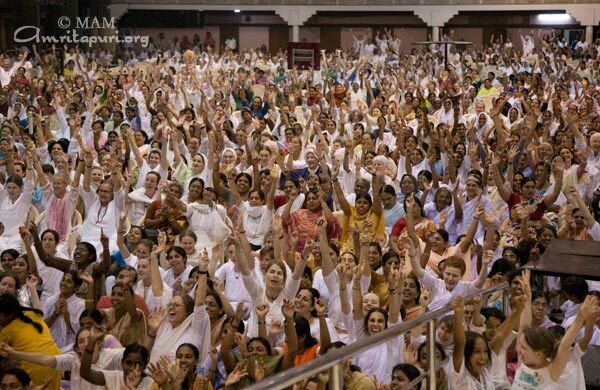 Amma then led everyone in chanting Om lokah samastah sukhino bhavantu. For five-minutes straight, the bhajan hall was filled with the resonation of the divine mantra wishing for the happiness of the entire world. Then Amma gave a message to all her children, in which she reflected on all the tragedies of past and asked everyone to pray for those who died or suffered due to those tragedies. 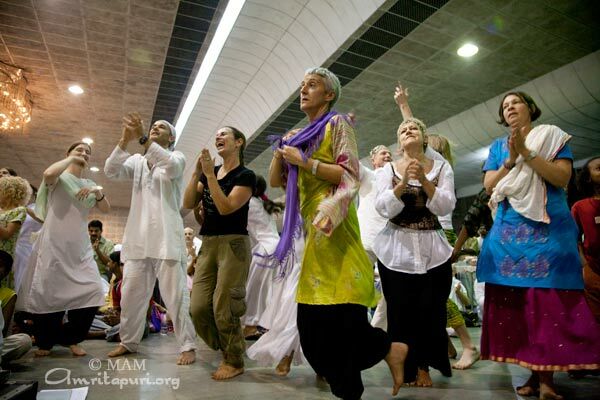 Amma then stood up, called for her kai-manis (hand bells) and—to the bhajan “Bhajore Bhajo Krishna Hare Ram”—blissfully danced. And thus 2006 was begun in celebration. Om Lokah Samastah Sukhino Bhavantu. This is the prayer that is chanted in Amritapuri, and by Amma’s devotees around the world, as the clock strikes midnight each New Year’s Day. The collective effect of many thousands one-pointedly chanting this powerful prayer for the peace and happiness of all beings everywhere serves to help purify the atmosphere, contributing positive vibrations to a world all too accustomed to its own negativity. 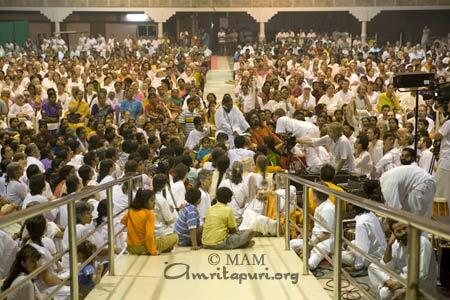 The ashram residents and visitors sat chanting the sacred mantra around Amma’s chair in the large hall, and Amma joined them just before midnight. Then, leading the prayer while the world entered the new year, Amma gave us the priceless blessing of inaugurating this year in a most auspicious way — by praying for the welfare of others. Amma was quick to remind us, however, that although the numbers of the year are changing, if we don’t change internally, then there is no real meaning in saying it’s a ‘new’ year. Amma said that the real change has to take place within us, by uprooting our latent negativities and cultivating positive qualities. This in turn will have the natural effect of changing the world for the better. Amma asked Her children to offer their thoughts on how we can contribute to the upliftment of the world in this New Year. Many heartfelt responses were given, but most shared a common element: that we all strive to practice Amma’s teachings on Love, Compassion and Selflessness, as this is the surest way to peace and happiness for all. 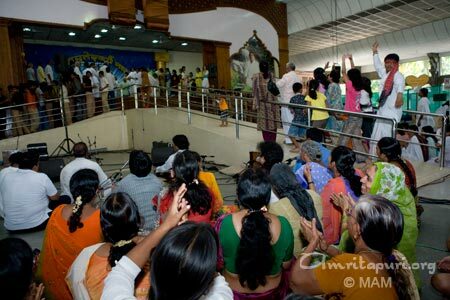 One devotee asked that we all be as willing to serve each other as we are to serve Amma, and another added to this saying that his wish is to learn to see Amma in all, so that he doesn’t have to always come to Amritapuri for Amma’s darshan! 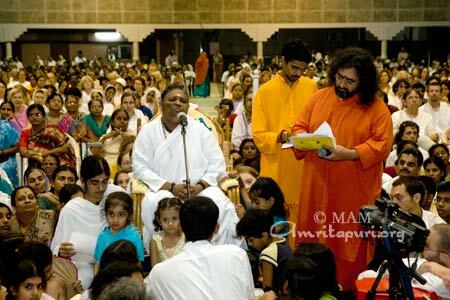 Many devotees shared touching personal stories. 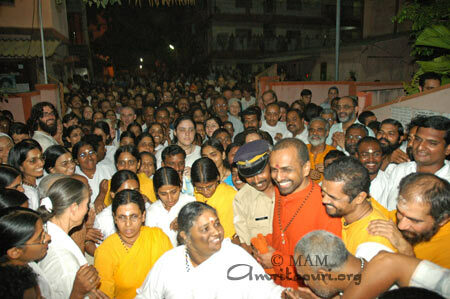 One person from Mumbai told how he had been meaning to come see Amma for many years, but never did. He had planned to spend this New Year as always with friends, but at the last minute had an insight into the meaningless of that type of ‘ happiness’ and felt a deep urge to seek the source of true peace. 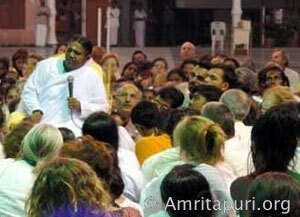 So, he immediately caught a train and came to Amritapuri to see Amma — without luggage or even changing his clothes! 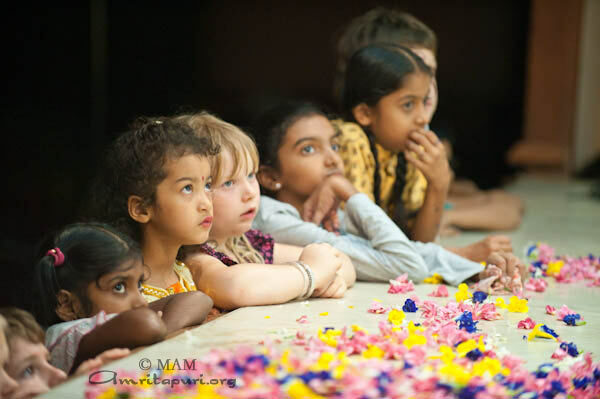 One devotee said that she thought the quickest way toward world peace was for more people to meet Amma, and a young girl approached and explained that this was her first time meeting Amma, saying it was a major turning point for her and she was now dedicated to the spiritual life. Another young girl who had just met Amma for the first time this day came up and spoke a few words, taking the mic nervously. She said that before today, she was too shy even to speak to two people at once… and now she was addressing Amma and a crowd of hundreds! 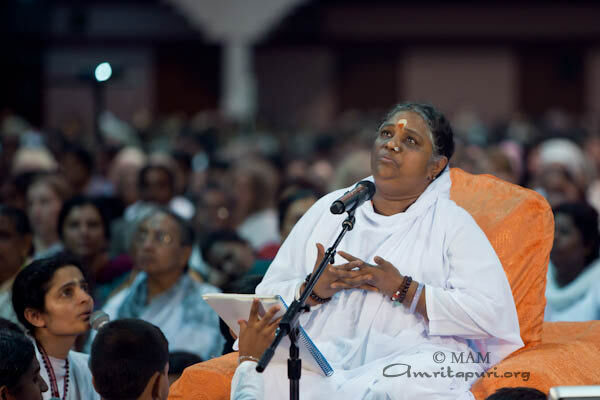 She said that she didn’t know how she was able to, and that it was Amma’s grace that gave her the courage. Her mother then spoke, saying that she was so happy to see her daughter speaking so confidently, and attributed it to her faith in Amma. She prayed that this faith and devotion last forever in her daughter’s heart. One of Amma’s engineering college student said that he made so many mistakes in the past year, and prayed that he may not repeat them. Amma really liked this simple but wise answer and clapped happily. 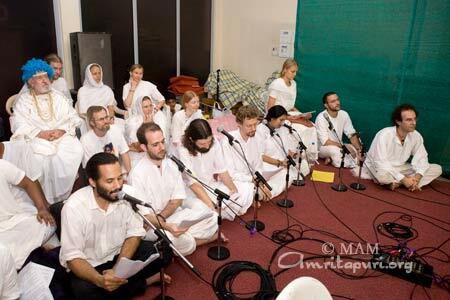 Two other devotees spontaneously offered songs to Amma, and many others offered tearful expressions of gratitude, one after another declaring that it is by living the life that Amma is teaching that we can find true lasting peace and happiness. After listening to all of Her children, Amma enjoined everyone to chant the Mahishasuramardini slokas to the great Goddess of protection, Durga. In Amma’s New Year message, Amma called upon us to pray for suffering humanity, particularly the victims of the recent devastating earthquake in Iran. Amma said that we should send our heartfelt prayers to the survivors, that their wounds, inner as well as outer, be healed quickly, and for those that have passed on, that their souls may rest in peace. With such intimate guidance from a great spiritual Master like Amma, we have only to listen to Her words with our heart and live Her words with a simple faith. Then will each moment be new, all bliss be ours, and an enduring peace be upon the earth. 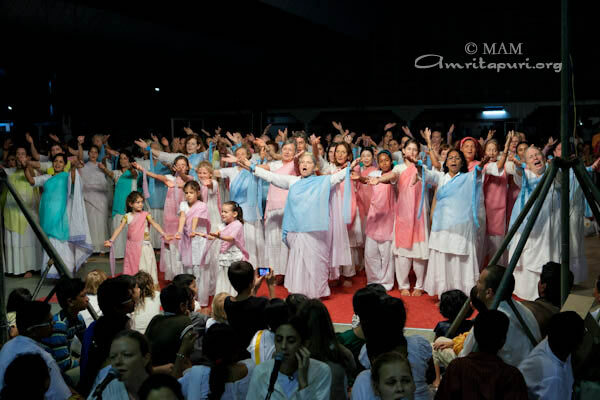 Happy New Year to all of Amma’s children, from Amritapuri!